Springfield and Chicago protests raise alarm about unfair overtime policy that undercuts independence for seniors and people with disabilities, as activists mount wider challenge to governor’s harsh austerity agenda at annual State of State address. CHICAGO–(ENEWSPF)–February 15, 2017. Two days of protests against Gov. Bryce Rauner’s austerity policies have forced a delay on a controversial vote on proposed limits to overtime for home services workers — a critical victory for people with disabilities and other Illinois residents who depend on home care to live independent lives with dignity. On Valentine’s Day, dozens of people with disabilities, their caregivers and union allies hand-delivered valentines to Rauner in downtown Chicago with a simple message: Have a heart! Drop harmful overtime rules and negotiate a FAIR budget that supports human services and the workers who provide them. Tuesday’s and Wednesday’s efforts were coordinated by the Alliance for Community Services, a broad coalition of Illinois residents and their caregivers, community groups and public service unions, united to put the “human” back in human services, stop privatization and threats to Medicaid and other public services, and promote accountable, accessible services that Illinois can be proud of. Rauner’s proposed new overtime rules for personal assistants, the caregivers who provide daily assistance to people like Susan, have particularly outraged people with disabilities and others who rely on them. Rauner’s overtime scheme would see PAs banned from caring for clients if they accrue more than three ‘unauthorized’ instances of overtime — essentially forcing these low-wage workers to work for free when their clients need extra help. Aarup and her allies condemned Rauner’s privatization agenda, his push to close public service offices, his strategy of engendering “assembly-line” bureaucracies and his attacks on caregivers and other low-wage frontline workers — all policies that Alliance members charge increasingly threaten services at a time when Illinois residents from low-income families to the elderly need them most. Rauner’s policies have locked out growing numbers of the state’s neediest residents from programs at a time when their families and communities can least afford barriers to service — while state service workers struggle with growing caseloads and community-based care-givers have wages and benefits that leave them squarely in the economic ranks of their impoverished clients. Drop his harmful overtime policy that threatens people with disabilities and penalizes workers for putting in the hours that their patients need. Support a FAIR budget where big banks and billionaires pay their fair share, and fully and fairly funds vital human needs that include health care, paratransit/public transit, affordable housing, $15/hr for service workers and properly accessible public aid offices. Close corporate loopholes that benefit the 1% at the expense of the rest of us. End the outsourcing of Medicaid public services to greedy private contractors. Save and improve Medicaid and Medicare, which serves hundreds of thousands of middle and working class Illinois seniors, children and families. Explore options like a Lasalle Street tax, which is dominated by the nation’s wealthy elites — and where the nation’s richest 20% own more than 90% of stock traded. 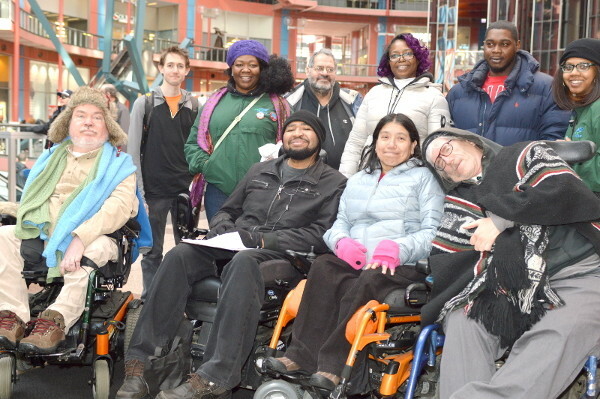 Members of the Alliance for Community Services include the elderly, low-income families, people with disabilities, frontline caregivers and service workers, and public sector workers. Participating organizations in Tuesday’s action included ADAPT, Northside Action for Justice, AFSCME Local 2806, AFSCME Local 2858, AFSCME Local 3506, IMPRUVE, STOP: Southside Together Organizing for Power, SEIU-Health Care, Northern Illinois Jobs with Justice, Democratic Socialists of America, Chicago Jobs with Justice, and the Movement for the 99%.